If you've been reading PolishGalore for any length of time, you'll know that I'm pretty terrible when it comes to nail art. I love the look, I love the creativity, I just don't have "it" when it comes to creating half the time. 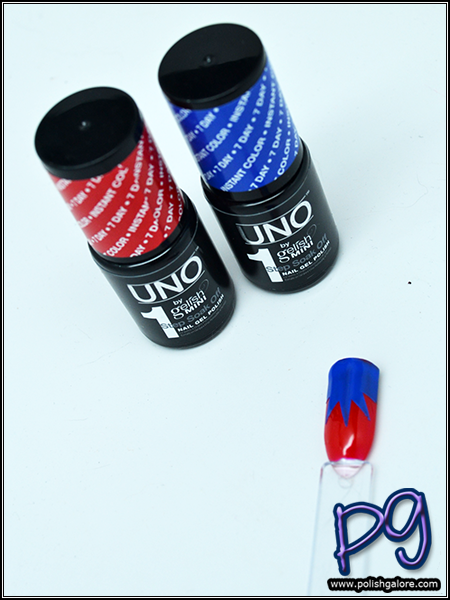 That's why when I got these new UNO by Gelish MINI 1-step soak off gels, I knew that I could probably create something awesome for Memorial Day using vinyls. Let's see what happens, right? 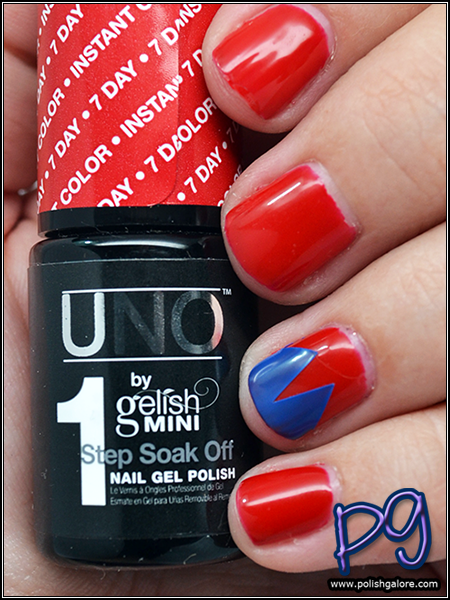 UNO by Gelish MINI is a single-step process for DIY gel manicures. That's right, no base coat, no top coat, and no cleansing involved. Just get an LED light and your choice of over 20 colors and get to work. These durable, high-shine manicures boast a 7-10 day wear time, providing you wrap your tips, keep the gel off your cuticles, and use thin coats when applying. Please do not confuse "1 Step" with "1 Coat". Side note: Do not use a LED lamp that has more than 18 watts. I have absolutely no idea the wattage on my LED lamp but it seemed to work fine with my nails. First, as with any manicure (gel or not), I properly cleansed my nail, removing all my old nail polish, and making sure my cuticles were off the nail plate. 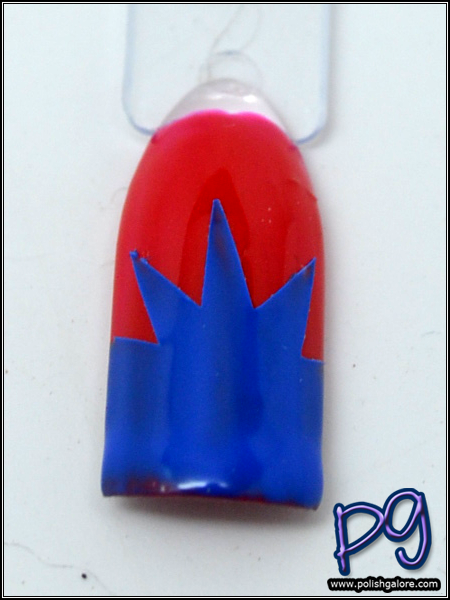 Next was prepping the gel bottle - this doesn't sound like much but you do need to shake the bottle to make sure all the product is properly mixed, as gel tends to be thicker than normal polish. Then I started with one thin coat of the red creme called Traffic Stopper and cured in my LED lamp (60 seconds). Then I added a second thin coat of Traffic Stopper and cured that for 60 seconds. Next, I used the Starburst vinyl from NailVinyls and placed it about halfway on my nail before using the blue creme called Very Blueberry and cured for another 60 seconds. Afterwards, I removed the vinyl and was good to go. Very Blueberry was pigmented enough that I didn't need a second coat. Now the only downside about using a vinyl with a 1-step gel is that there isn't a top coat to "seal" the edges of the vinyl. My vinyl didn't lift or get caught on anything but at the same time, my nail wasn't as smooth as the others, so I made this an accent nail only. A top coat would have smoothed everything out but that would have defeated the purpose of using UNO. To remove, start by gently filing the surface of the gel with a 180 grit file to remove the shine (the nail should look matte), then place a cotton ball with your choice of remover on the nail and wrap with foil. There are many different products on the market to help aid you in removing your gel - I prefer the Steam Off by Katie Cazorla. You still file the surface but then you place your hand in the machine for 10 minutes and the steam created from the acetone penetrates to the polish and steams it right off. I've been using it every time I wear gel, without any issues. The final look! I wore this to a baseball game on Sunday and it lasted me well. I did not wrap my tips and because of it, I had tip wear after Monday's chores of washing dishes and doing laundry. I will be wearing more of the colors as this month goes on as June will be really busy for us and can't wait to show you more colors! 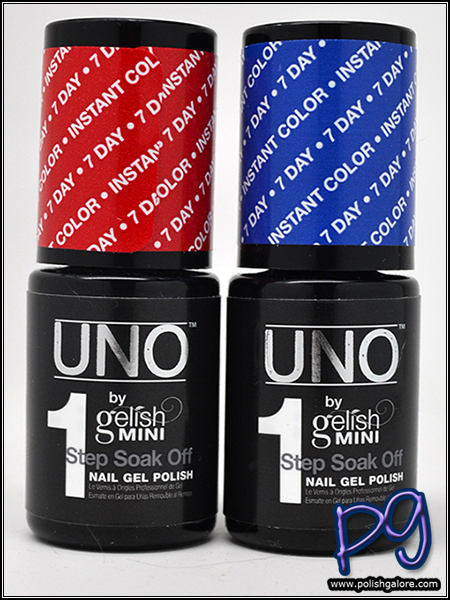 UNO by Gelish® MINI products are available exclusively at Sally Beauty Supply stores nationwide and online at sallybeauty.com for about $11.50 for a 5 mL/0.17 fl oz bottle. Follow Gelish® MINI on Facebook, Twitter, Tumblr and on Instagram.